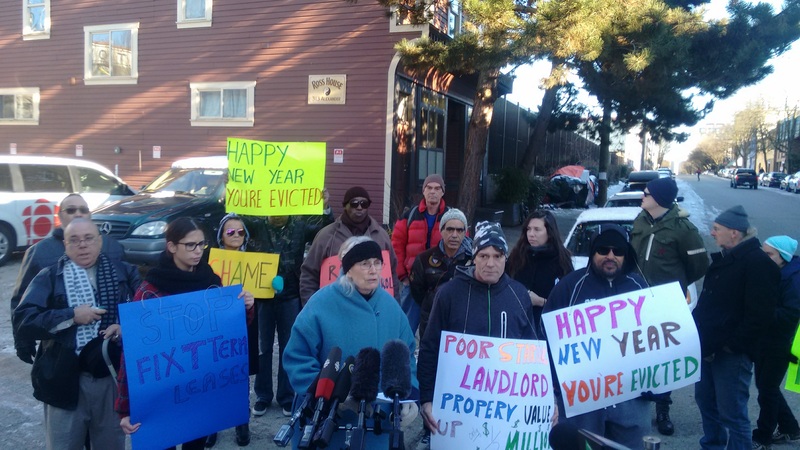 Right at a news conference on Jan 1, the Ross House landlord deactivated the key fob of one of the tenants, Aurora Dunkley-Johnson, who was speaking out against the injustice. This meant Aurora couldn’t get into the building where her room was unless another tenant let her in, which they did. Later the landlord evidently realized her action was illegal and reactivated the fob. Aurora and other tenants, trusting their landlord and not knowing their rights, had signed a fixed term lease that let the landlord evict them or raise their rents after 2 months. Rumours are that other DTES landlords are asking tenants to sign these leases, or to initial the box on the Residential Tenancy Act form that allows the landlord to fill in the rest of the form and then evict tenants at will, or raise their rent as much as they like. But the landlord does need an order of possession and didn’t have one and eventually let Aurora back in. “We think we have a legal case for these tenants at the Residential Tenancy Branch,” said Wendy Pedersen of the SRO Collaborative. “This kind of intimidation is not unique for this building, tenants are feeling this across the neighbourhood.” Pedersen is helping tenants get legal advice from advocates at First United Church.